Choose a flavor or make all three! Heat a waffle iron per manufacturer’s instructions. In a medium bowl, combine the waffle mix of choice. Pour ¼ cup mixture into each waffle iron mold. Place two popsicle sticks into each mold, creating two waffles from one waffle mold. Heat the waffle until golden brown. Remove from waffle iron, cut in half with scissors and trim if needed to create two separate waffles on a stick. Place on a wire rack and allow to cool. Repeat with remaining batter. For banana chocolate pecan waffle and s'more waffle: In a heat-resistant bowl, heat the chocolate in microwave at 20-second intervals, stir until melted. Drizzle over waffles. Sprinkle with pecans or graham crackers. Refrigerate for 5 minutes. Serve. For strawberry waffle topping: In a small bowl, combine the powdered sugar, milk, strawberry preserves and food dye. Mix until smooth. 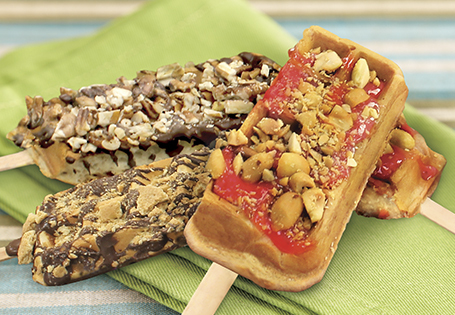 Drizzle over waffles and sprinkle with peanuts. Refrigerate for 5 minutes. Serve.